Welcome to Fremont, Center of the Universe. Fremont is Seattle's bohemian section of town just north of city center along the canal. It has a world class collection of quirky public art. Have you ever fired a rocket or participated in an ART ATTACK? Would you like to meet a troll's cousin? These are just some of the things we do on our entertaining public art walk which is a distinctly Seattle experience. Our tour guides are a piece of art work in themselves. There is The Fremont Fairy Godmother, Jeffe, the Turkish Rap Singer and Rocket Man, Super Hero sort of to name a few. They each carry props and will playfully involve strangers in the street who have NO IDEA they are going to be a part of our story. This makes each tour fun and unique. Our mission is to "Encourage people to find their playfulness through art and history". Afterwards, you can visit the many local shops and restaurants along the canal or wander through the Fremont (European style) Sunday Market. Our motto is Libertas Quirkas which in bad Latin means "the freedom to be peculiar". The Fremont district is Seattle's most playful neighborhood with a world class collection of quirky public art. Come see our collection on this tour, a street theater. Our program promotes public art with a mix of public sculpture and improvisational street theater. 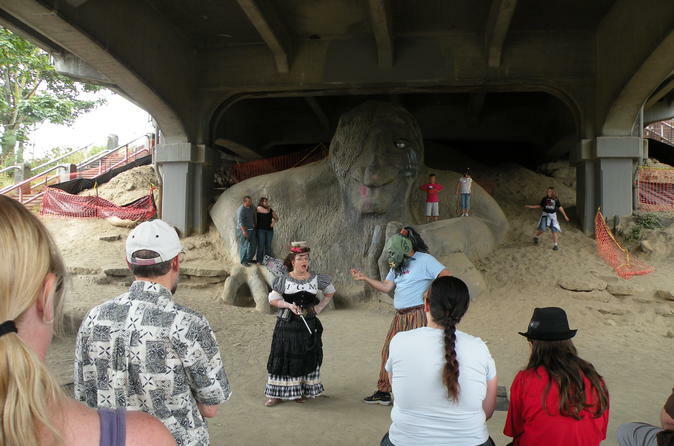 We are very interactive as we participate in an ART ATTACK, fire the 47' Fremont Rocket and meet the Fremont Troll's cousin. Our tour guides are a piece of art in themselves. There is The Fremont Fairy Godmother, Jeffe, the Turkish Rap Singer and Rocket Man, Super Hero sort of - to name a few. We carry props and will playfully involve strangers in the street who have no idea they are going to be a part of our story. This makes each tour different and quite entertaining. Our mission statement is to "Encourage people to find their playfulness through art and history." And this is what happens. COME PLAY! !